New Account Savings! Prime Ocean Front and With In Walking Distance To The Beach! UNIT 102 AT THE LAULOA RESORT 'DIRECT OCEANFRONT!' Only a few minutes walk to the longest beach on Maui (approx 5 miles long). A resort that's immaculately maintained and charming in every way. Located in the quaint harbor village of Maalaea. RELAX, KICK BACK AND HAVE THE BEST VACATION OF YOUR LIFE! Everything you're looking for is right here in Maalaea 'the most central location on Maui: aquarium, shopping, activities, restaurants, swimming, surfing, snorkeling, beach combing and sun worshiping (5 miles of sandy beach near-by to enjoy)! 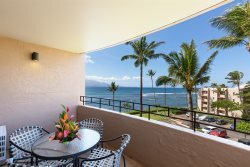 Relax and sip your Mai Tai in this nicely appointed and furnished condo retreat with it's soothing sights & sounds of the ocean from your living room, master bedroom and lanai, a view of the breathtaking Maalaea Bay, the grand volcano Haleakala and the sparkling Kihei lights at night. Oh and there is a Giant Green Sea Turtle Habitat right out front and along the rocky coast line there so you can watch them to your hearts content! All the important amenities are here for you with in-house stackable washer & dryer, master king size bed, private master bath walk-in shower and tv/cable, guest room queen size bed, with tv/cable, guest bath with tub/shower combo, air conditioning between the master bedroom and living room (wall a/c), free wireless Internet, 70" flat screen smart tv in living room "Wow"!, free cable, "Comfy" decor with a "Brand New Fancy Faux Leather Electric Recliner Couch" - Each end of the couch has a powered recliner to help you and another put your feet up and get the relaxation that you dreamed of, deserve and came to Maui for! A more than well stocked kitchen, upgraded towels and sheets, extra large private lanai, pool conveniently located just outside your door which is great for families with kids or if you just like having quick, easy access. Plenty of pool side lounges and a BBQ, beach chairs, beach umbrella, beach towels, binoculars for whale watching, cooler for your excursions, free on site parking. Aloha, Just a word to express our appreciation. Lauloa 102 was just like advertised. We loved being on the ground floor as it made going to and from the pool so convenient. Everyday we watched sea turtles swim right up to the sea wall right out front of the condo. Both the master bedroom and the living room face the ocean so we could listen to the waves. The master bath turtles are great! The nice ocean breeze gave us fresh air the whole trip we didnt need the air conditioner at all. We especially enjoyed the huge TV and the couch with two electric recliners, super comfy. Location to Lahaina and Kihei were perfect. There were a couple of restaurants and a great beach near-by that we walked to. We just loved staying there, It was our dream place to vacation and we will be back! Once again thank you and Mahalo!